Sleeping on our natural kapok pillows will lull you into a deep, peaceful rest. Kapok pillows are an organic, hypoallergenic alternative to down pillows. The supportive kapok fill is enhanced by our luxurious organic cotton cover & will give you the rejuvenating sleep you deserve. A fiber from a renewable natural source, kapok is harvested from the seedpods of the once-sacred ceiba tree. This tree, known for its medicinal uses, also provides food, shelter and transportation for its ecosystem, including man. It is 8 times lighter than cotton and has a uniquely supportive quality without the dust-mites or allergic discomforts that down pillows may cause. All natural & allergin-free! Covered with unbleached 100% Organic Cotton muslin on the outside to keep everything natural and super comfortable to the touch! 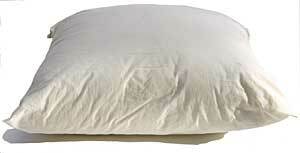 Machine washable organic cotton muslin covers are also available for all pillow sizes. Made in the USA (California). Choose any size for 100% organic cotton comfort on the outside and all natural, organic, chemical-free support comfort on the inside.